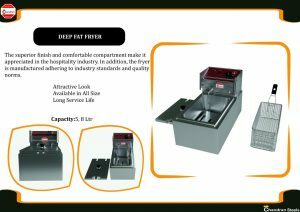 The Deep Fat Fryer manufactured and supplied by us in the market, are known to be amongst the finest that are available in the market. Manufacturing of this range is done in compliance with the set industry norms and guidelines, utilizing the finest raw materials and modern machines. Owing to this, the offered range is known to have a superior performance, resistance to corrosion and durability. We, chandran steels , came into being in the year of 2000 as the manufacturer, supplier, trader, and wholesaler of Freezer and Kitchen Equipment. In this range, we offer Bakery Display Counter, Commercial Kitchen Equipment and Gas Range. This offered range is fabricated and manufactured using high-grade stainless steel and others required basic material, procured from the established vendors of the industry. We design this series with the greatest precision keeping in mind prevailing markets demands and industry laid parameters. With a representation to meet different demands of the clients, we have made the offered variety available in different sizes and designs at an economical price. We also provide customization facility as per the requirements of the clients. Moreover, we also present customization facility for our products as per the provided configurations of the clients. Our variety is available in different design, patterns, sizes and shapes to meet the particular needs and specifications of the clients. We assist as a direct factory supplying and as a result of this, we have been able to market our products at lower prices and offer quicker delivery to our customers than many of our competitors. This flexibility, as well as industry excellent turnaround times, has provided our customer base to grow across Industries in the market.